Roman tombs have been unearthed in southern Turkey, giving a glimpse into thousands of years of history. 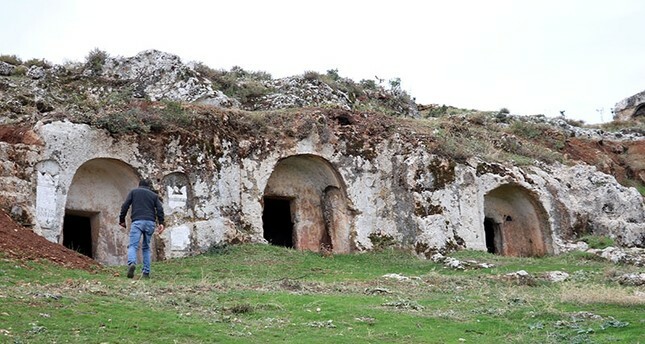 So far, 19 rock tombs have been cleaned and examined in the necropolis in the Altınözü district of Hatay province, where the ruins of the ancient city of Antioch are located. Some of the tombs have epitaphs such as "lived and died shamelessly," "keep the spirit," and "rest in peace." A team of 30 workers and an archaeologist are working at the Yunushan neighborhood under the supervision of the Directorate of Hatay Archeology Museum. Hatice Pamir, head of the archaeology department at Mustafa Kemal University, said that research on the area has been conducted since 2007. She said the writings on the tombs gave provided information about those who were buried there and their culture. "The necropolis shares important data about the culture and traditions of that period," she added. The excavations are part of a project by the district governorate and municipality to increase the number of tourists in the region. The ancient city of Antioch was established by Seleucus I Nicator, one of Alexander the Great's generals, in the fourth century B.C. It is known to be the first place where the followers of Jesus were referred to as Christians. Hatay is well known for its Roman-era mosaics dating back to the second and third centuries B.C.